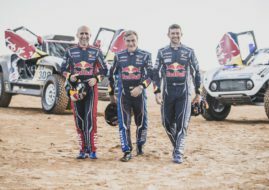 Carlos Sainz clinched his first stage win at Dakar rally 2016. 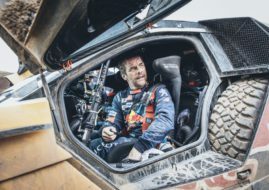 Peugeot driver was the fastest in stage 7 from Uyuni to Salta with a special stage of 336 km and claimed the sixth consecutive victory for the French manufacturer. A thunderstorm caused much trouble to competitors and the stage was cancelled for the bikers, but the cars continued to race during one of the hardest sections on the route. Sadly, Dakar rally today took its first victim as one 63-year-old spectator was killed after the Mitsubishi Lancer of the French driver Lionel Baud hit the man on the track. 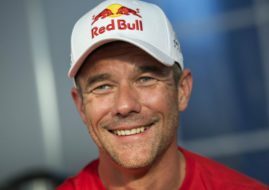 Sebastien Loeb was in the lead until checkpoint 6, but Sainz managed to overtake him in the final phase of the stage. The Spaniard set the time 5:34:03, leaving Loeb in second place, 38 seconds behind. Reigning champion Nasser Al-Attiyah in Mini finished third, with a gap of almost three-and-a-half minutes. Stephane Peterhansel finished fourth, only five seconds behind Qatari driver, while another Mini driver Mikko Hirvonen was fifth, with a gap of 4:07 minutes. Stephane Peterhansel spent only one day on the top of the standings. Sebastien Loeb claimed back the leading position in the overall standings. Now he is 2:22 minutes ahead of his team-mate and compatriot, while Sainz sits on third place, 4:50 minutes behind. Al-Attiyah is still on fourth with a gap of 17:36 minutes and Mikko Hirvonen moved up to fifth, overtaking Giniel De Villiers. After a day of rest, drivers will face first dune sections on Monday, during the stage from Salta to Belen with a 394 km special. They will also notice the navigational difficulties which have been introduced this year to complicate their existence. Lots of minutes could be lost by vehicles blocked in the sand.